One metaphor for this collision of new and old is the slow, irresistible movement of continental drift. Consider how the Indian peninsula has, over the millenia, imperceptibly shouldered into the huge Asian landmass. The consequent pressure resulted in the vast, chaotic folds of the Himalayas, taken here to represent a century of perplexity and transition. On the one hand, we have the immovable mass of Asia, that is, the order of representations that tends to change slowly if at all (in this case, the Catholic heritage of Europe). On the other hand, we have a continent adrift, that is, the changes in lifestyle set in train by the unprecedented development of industry in the 19th century. Theories alone, after all, have never overthrown a society. Philosophers have always criticised traditional views, yet this has never prevented the survival of a deeply traditional society in rural areas. Indeed, nothing might have changed if men and women in great numbers had not been torn away from their native environment and precipitated into radically different circumstances. It was this dizzying collision between symbolic representations and everyday lifestyle which ultimately threw up Himalayan ridges where once there had been rolling plains. 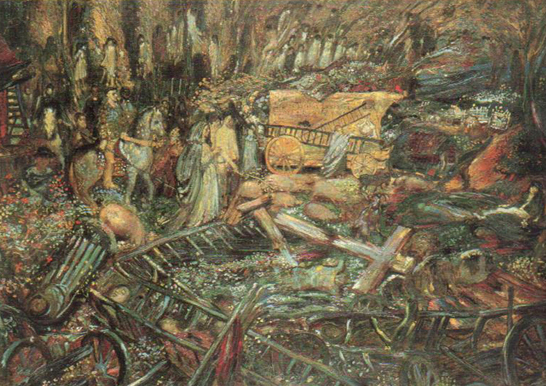 This collision is the subject of a painting, The Great Upheaval (Le Grand Chambardement) by the Belgian Symbolist artist Henry de Groux. 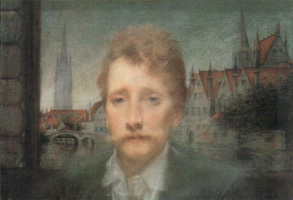 The artist and his family twice had to flee cholera epidemics. 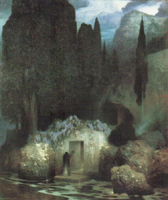 In this unfinished work, there is nothing archaic about Bocklin's vision of "the plague". Today, the image might be taken to refer to a contemporary reality such as AIDS. Меn and women, some on foot, some on horseback, leave a place of devastation. In the foreground lies a broken cross. The enclosure in which it stood has also been levelled. We find here a naive but eloquent expression of the collapse of representations of the traditional world in a society undergoing rapid change. It depicts men and women, some on horseback, others on foot, leaving a place of devastation. In the foreground lies a large broken cross. The enclosure in which it stood has been laid waste like the area around it, and the inhabitants are impelled to move on. A closer look belies one's first impression; this picture does not represent the kind of exodus made familiar by the last two European cataclysms, but a purely spiritual "upheaval". An entire society takes leave of a familiar and beloved land and sets off into exile, into the unknown. 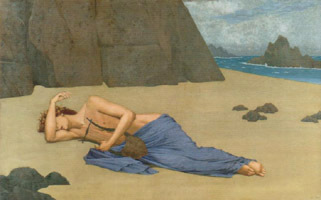 This melancholy constatation is central to the Symbolist outlook. At the end of the 19th century, while science and positivism triumphantly announced a brave new world founded on reason and technology, some people were primarily aware of the loss of an indefinable quality which they had found in the former cultural system, in the values and meanings signified by what we might call its "emblematic order". It is thus no accident that a broken crucifix lies at the heart of Henry de Groux's painting. In all its ambiguity, the cross is the central symbol of a representation of the world that acknowledges more than one plane of reality. In the Christian world view, there is the created world of nature, and an increate, divine order which stands above it. (Or, to take a more secular perspective, the real might be contrasted with what Guillaume Apollinaire, in a coinage that met with unexpected success, termed the "surreal".) The positivist, on the other hand, acknowledges only one level of reality: nature. In his perspective, the "other" world is merely an illusion. To which some were inclined to retort: "You tell us that the other world is illusory. Perhaps it is. But it is there that we choose to live." It is with these people that our book is primarily concerned. This sort of response might be prompted by a religious frame of mind. Or it might be motivated by a taste, perverse or otherwise, for solipsistic self-indulgence. The "other world" might be the world of the Divine; it might equally be a world of artistic delectation, that parallel world in which the fictitious des Esseintes, hero of J.-K. Huysmans' Against Nature, and his contemporary, the very real King Ludwig II of Bavaria, sought to take refuge. In either case, we recognise a degree of neurosis or madness. But that is not the whole point. The question that we must ask is this: were the depressions of des Esseintes and the eccentricities of Ludwig of Bavaria the result of some specifically cultural malaise? To understand this question, we must sketch in some background. Twentieth century anthropology presents a culture as a web of values and meanings which allows men and women to decide where they stand and how to find their way in the world. It is therefore no coincidence that those who most deplored the loss of meaning and value were most receptive to Symbolism. "It is all too clear," wrote the Symbolist poet Gustave Kahn, "that these people move only in search of resources, and the source of dreams is running dry." While the logic of science, industry and commerce might be capable of satisfying the practical needs of society and the individual will to power, Gustave Kahn's metaphor suggests a thirst that can be quenched only at the source of dreams. 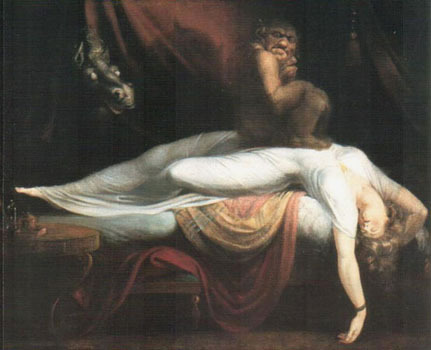 The metaphor of dream perhaps offers too many hostages to the critical spirit of the time, which was all too inclined to identify dreams with the unreal. Nevertheless, even those for whom the positivist world view was a source of dissatisfaction and anguish tended to be overwhelmed by the compelling force of its oppressive, virile power. 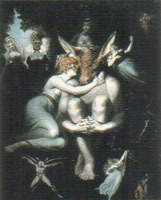 Bocklin's strong personality found in antiquity a vast repertory of allegorical and svmbolic subjects. 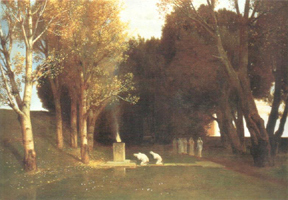 Keller was a history painter who developed an enthusiasm for Bocklin late in his career.Тhis homage, painted after Bocklin's death, is redolent of the heady perfume of Symbolism. Water so lifeless, that it seems fatal. in which the moon itself finds it painful to live?" Georges Rodenbach's verse is eloquent of the mood of depression and decline that characterises the Symbolist state of mind. Symbolist poets were inclined to evoke the moon rather than the sun, autumn rather than spring, a canal rather than a mountain stream, rain rather than blue skies. They complained of sorrow and ennui, of disillusionment with love, of impotence, weariness and solitude, and they lamented their birth into a dying world. but what a long arm it has, and how remote its womb! Why don't we love one another for our own sakes in our own little corner? and kill themselves? Infinity, show us your papers!" "Infinity, show us your papers!" The tone is one of truculent defiance, and it is characteristic of those who discover the relativity of a culture which they had innocently believed to be the vehicle of absolute truth. Symbolism was imbued with a powerful nostalgia for a world of meaning which had disintegrated in the space of a few brief decades. This is the reason for the melancholy and anxiety expressed whenever an artist looks beyond the surface of things. 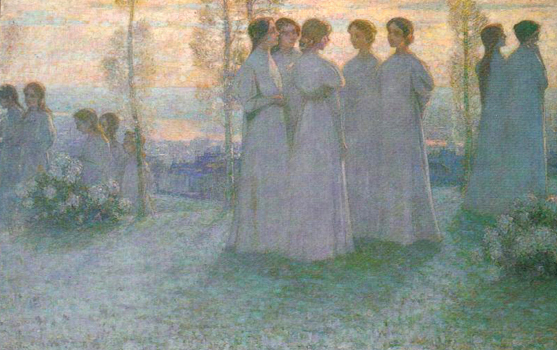 For if a whole series of Symbolist artists strike one as sickly and emollient - one might cite Edmond Aman-Jean, Lucien L�vy-Dhurmer, Charles Maurin, Edgar Maxence and Alphonse Osbert - it is because they chose to ignore reality; they preferred to offer a comforting illusion in perpetuating what had already ceased to exist. To what, then, does the "symbol" at the heart of Symbolism stand opposed? By now, our answer is clear: to the limited "reality" of the age, to the given, to the profane. A symbol, by its very nature, refers to an absent reality In mathematics it signifies an unknown quantity; in religion, poetry or art, it lends substance to an unknown quality - a value that remains out of reach. In a religious context, this quality is unknown (or unknowable) because it belongs to a different order of reality - a supernatural order - and can therefore be signified only by a sacred object. The sacred, in this view, is merely a semantic category, and should not be confused with the divine; as the Chinese sage puts it, one must not confuse the moon with the finger that points to it. But even the irreligious must acknowledge that there are things to which we cannot directly refer. We need symbols to communicate these things. This is the core of the conflict between the two world views: on the one hand, a given and immutable world, favourable to trade and industry but indifferent to the values which lend substance and savour to life; on the other a world dialectically related to a transcendent model (religious, visionary or poetical) that spurs the individual to action by proposing a creative transformation of the given. Western civilisation in the 19th century underwent a surgical operation which severed these two components of our relation to the world. From that point on, it seemed, reality could no longer lend its weight to the dreamer, nor dreams bestow wings upon reality. The two were at war. It is thus apparent that Symbolist art does not merely touch upon long-standing illusions which society was finally learning to overcome. Nor is it simply the naive expression of some first, tentative forays into the realms of the unconscious, a world soon to be charted so thoroughly. It goes much further than that, pointing to the constantly shifting state of culture and to what the eminent Hellenist E. R. Dodds termed an "endogenous neurosis". 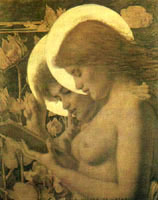 This explains why a significant part of Symbolist art reflects a new uneasiness in the relations between men and women. For culture does not only confirm the individual's personal identity, it also provides the foundation of his or her sexual identity. Though this identity has a physiological foundation, it is also, inevitably, a cultural construction. A breach or dislocation in the body of culture will inevitably affect the mode of interaction between men and women. Here the relevance of Georges Duby's analysis of the Middle Ages is clear: "Fissures appear at the points of articulation; they grow gradually wider and eventually split the body apart, but they almost always turn out to exercise their corrosive effect only insidiously. In spite of the illusion fostered by the apparent tumult of merely superficial agitation, it is always in the very long term that their reverberations bring about collapses, and these are never more than partial since indestructible vestiges always subsist." It is thus the nature of Symbolist art to attempt to record a process which had till then been massive, involuntary and very largely unconscious - though the collective will and the decrees of those in power had always had some power over it. The role of symbols as the traditional cement of the community had been tested during catastrophes. But by orcibly removing unprecedented numbers of men and women from the countryside and transforming them into the atomistic individuals of the newly created proletariat, the Industrial Revolution not onli made adjustment more difficult; it modified the order of priorities. "Grub first," as Bertolt Brecht and Kurt Weil's Threepenny Opera puts it, "Morals later!" For the new city-dwellers, solidarity in obtaining the necessities of life replaced the former community of meaning. The upper class had greater leisure to ponder the loss of meaning implied by the new order of things. Involvement in militant activity might do duty for a sense of community among the impoverished; for the rich, all sense of community was lacking. Symbolism is thus the negative imprint of a bygone age rich in symbols and the expression of yearning and grief at the loss of an increasingly idealised past. Those who had the means to do so sought solace from the brutal pursuits of the world by sipping at the soothing philtre of the arts. But even they were confronted with anxiety and nightmares from which none could then hope to be exempt. Symbolist portrait in the form of a fan. These plump, appetising young saints have more in common with pin-ups than with stained-glass windows. 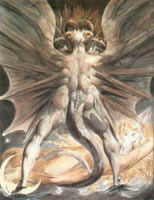 The visionary nature of the work of the self-taught Blake suggests a filiation with certain of the fantastical aspects of Symbolist art.